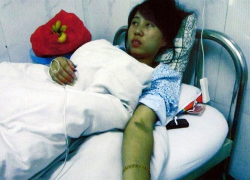 A Chinese woman who was forced to abort her 7-month old fetus has found herself in the center of international controversy after she claimed that local officials were holding her in the hospital against her will and that her husband had disappeared. Twenty-three year old Feng Jianmei and her husband Deng Jiyuan, who already have a five-year old daughter, had been ordered to pay 40,000 yuan ($6,300) for violating China’s strict one-child policy. When they failed to pay the fine, Jianmei was reportedly beaten and forced to sign an agreement for an injection that induced her late-term abortion. Media caught wind of the story when graphic photos of Jianmei lying next to her aborted daughter were posted online. Local news media reported that the family had consented to the abortion, but Jiyuan had vehemently denied that. The young parents have also been the center of criticism for being traitors for talking to foreign media. The family’s comments to foreign media outlets were met by protesters carrying banners accusing Jianmei and Jiyuan of treason. Jiyuan’s sister told a Hong Kong newspaper that he was being followed by security officers when he visited his wife in the hospital. He had planned to bring Jianmei home, but that plan was interrupted when unknown men prevented him from getting into a taxi at the hospital. The case has sparked anger over the practice of forced abortions and sterilizations under the guise of China’s one-child policy. China has been implementing the strict one-child policy since the 1970’s as a way to control its increasing population. While it is illegal under Chinese law to undergo such a late-stage abortion, government officials have been known to compel women to have abortions to meet the country’s birthrate targets. The government has since suspended three of the family planning officials who were involved in the forced abortion, and required them to apologize to the young woman. The local government has also offered the family some compensation. Aiden Kramer is a rising third year law student at DU and the Executive Editor of The View From Above.